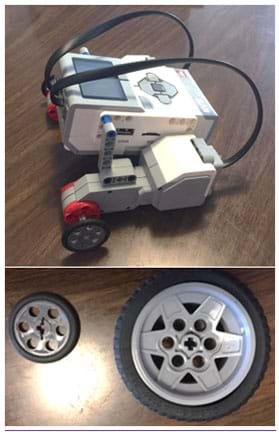 A LEGO MINDSTORMS EV3 robot and its different wheel sizes. Students analyze the relationship between wheel radius, linear velocity and angular velocity by using LEGO® MINDSTORMS® EV3 robots. Given various robots with different wheel sizes and fixed motor speeds, they predict which has the fastest linear velocity. Then student teams collect and graph data to analyze the relationships between wheel size and linear velocity and find the angular velocity of the robot given its motor speed. Students explore other ways to increase linear velocity by changing motor speeds, and discuss and evaluate the optimal wheel size and desired linear velocities on vehicles. Being able to isolate one target variable and observe how it changes while holding all other possible variables constant helps engineers of all disciplines better understand how the target variable works within the constraints of the system. Engineering examples of isolating variables to observe how they respond in a constrained system include the stress testing of materials, integration of wireless transceivers, and culturing of proteins for specific tasks. As another example, when a company tests a new fertilizer, it uses standard soil conditions and a constant test plant with a known growth pattern in order to isolate the fertilizer as the variable. To test, the fertilizer is fed to a group of plants and their growth patterns are compared to the patterns of the constant ("control") plants that did not receive the fertilizer. Data analysis indicates whether or not the company should market the compound (due to positive results) or do more testing. In this activity, to determine what wheel configurations result in the robot traveling a 200-cm distance in the fastest time, students isolate and observe the wheel size variable, while constraining the problem to have the same power level and frame. Comfortable with substituting and manipulating equations. Comfortable plotting data and estimating a line of best fit for that data. Able to determine the equation for the line of best fit drawn on a graph. Familiar with linear velocity (speed) and the relationship between linear velocity and angular velocity (linear velocity = angular velocity x radius) and have practiced problems at a comprehension level. Describe the relationship between wheel radius, diameter, angular velocity and linear velocity. Change a robot's motor speed and wheel radius/diameter to produce various linear velocities. Evaluate the design choice of different wheel sizes on various types of vehicles. Note: As an alternative to the LEGO EV3 robot, many other viable alternative robot kits exist that allow you to vary the speed of the motor that controls the wheels. For example: LEGO MINDSTORMS EV2, Parallax Boe-Bot Robot, VEX Robot and Arduino-controlled robots. See the Additional Multimedia Support section for details and links. Why do average cars use 16- to 17-inch tires and drag racers use 24-inch and even larger tires? Why do different vehicles have different tire dimensions? Which person is moving faster if both are turning at the same rate: a child in a kiddie Ferris wheel with a diameter of 12 foot 6 inches or an adult in a larger Ferris wheel with a diameter of 180 feet? How do they compare to the world's tallest Ferris wheel, the High Roller in Las Vegas, built with a diameter of 520 feet? Angular velocity—how fast a point on a circle is changing position—and radius both affect linear velocity—how fast an object is moving in a straight line. Engineers consider tire sizes when designing vehicles and must test variables like radius and angular velocity in order to develop optimal designs. The radius of a tire can affect the speed of a vehicle because of the relationship between linear velocity, wheel radius and angular velocity. Other factors may also affect a car's speed, such as weight, torque and friction. Today we are going to examine wheel sizes on EV3 robots to see how the wheel radius affects the speed of the robot—just like an engineer would. But what about the angular velocity? If we know the wheel radius and the speed of a vehicle, can we calculate the angular velocity of the tires? What aspects of a vehicle control its angular velocity? Let's find out! angular velocity: The rate of change of angular position of a rotating body. Typical units are radians per second or revolutions per minute (RPM). diameter: A line segment that passes through the center of a circle (or sphere), with both endpoints on the circle (or sphere). linear velocity: The rate of change of an object's position, or speed of the object, in a straight line. Typical units are meters per second or miles per hour. velocity: The speed of an object in a given direction. Gather materials and make copies of the Pre-Activity Worksheet , Activity Data Sheet and Post-Activity Worksheet , one each per student. Provide enough floor space to run the experiment—a length of about 200 cm (~6 feet, 6 inches) is suggested. Use tape to mark the following distances from the starting location: 0 cm, 50 cm, 100 cm, 150 cm and the finish line at 200 cm. Track width can vary from wide enough to accommodate one LEGO robot to multiple lanes, which can expedite the testing process. Build the EV3 robots, one per group, according to the 5-Minute Bot building instructions at http://robots2doss.org/2013/10/5-minute-bot-for-the-ev3-kit/ . Either have instructors do this for all groups or provide time for students to assemble their robots in advance. Download the EV3 robot program file, angularvelocity_program.rbt , and load it on to each group's EV3 intelligent brick. This program correlates directly to the data sheet. Make sure that all the EV3 microcontroller (intelligent brick) batteries are fully charged. Distribute a pre-activity worksheet to each student. Give students 10 minutes to complete their worksheets. As a class, spend five minutes discussing students' answers, angular velocity, linear velocity and real-world applications. Hand out a data sheet to each student. As a class, have students estimate which of the robot's wheel configurations will result in the robot traveling the 200-cm distance in the fastest time . Divide the class into groups of three students each. Provide each group with a LEGO robot. Randomly assign each group a wheel configuration, making sure that approximately the same number of groups test each wheel configuration in the first round of testing. Direct students to use a ruler to measure the diameter and radius of their wheels and record the measurements on the data sheet. Based on the assigned wheel configuration, have students record on their data sheets their estimations for the fastest time for the robot to travel 200 cm. Later, students can compare their original estimations to the results they obtain throughout the activity. Have students get a feel for using the stopwatch and timing the robot as it passes the 50-cm, 100-cm, 150-cm marks and the 200-cm finish line. Point out that minimizing measurement tool and human errors helps to ensure the collection of accurate data. Have one team member be the timekeeper, using the stopwatch. Assign another team member to record in the designation section of the data sheet the time taken to cross the 50-cm, 100 -m, 150-cm and 200-cm marks. Have the third team member be in charge of starting and stopping the robot. Students may trade roles if they like, but it is not required. Have each group start its robot, and proceed to measure and record the time taken for the robot to cross the four marks on the track. Repeat this process four times for a total of five trial runs. Expect this to be relatively quick considering the robot just needs to be restarted before each run. Have each group member write on his/her data sheet the recorded times from the timekeeper, and then begin to plot the data on the Linear Velocity Graph 1 on the data sheet, representing the linear velocity of the robot. Expect students to be able to draw an estimated line of best fit that represents their collected data. (Note: The slope of the line of best fit is equal to the average linear velocity.) Plotting the data enables them to examine their results visually as well as numerically, when discussing as a class. As a class, discuss which robot was the fastest by comparing each group's results together. This is a valuable exercise so students to see the correlation between each group's results since each group has different wheel sizes. Direct students to examine the data collected in the previous steps from each group in order to make inferences about the robot's wheel size and how it correlates to the speed. Have students calculate the angular velocity of their robots using the equation ω = ν/r and compare their robots' angular velocities to the average angular velocity for the class. Ideally, expect students to realize that even though robots from different groups traveled at different linear velocities, they all had the same angular velocity. Therefore, the linear velocity is dependent on the wheel size. Ensure that each student is following along and filling out the data sheet with the data as it becomes apparent through his/her own calculations as well as the classroom discussion. Two LEGO EV3 robots with different-sized wheels. By calculating the linear and angular velocities of the robot's data and determining their relationship, expect the class to be able to use the equation to come up with ideas on how to optimize their robots to increase speed performance. Wheel size can be altered. Another option is to increase the power at which the robots' motors run. This increases the angular velocity, and since the linear velocity is directly proportional (as long as the wheel size is consistent), it would likewise increase, thus optimizing the robot's speed. In their groups, have students make changes to their robots that they identify as appropriate for increasing the robot speed. Direct them to make one change at a time and then retest the robot. For example, students might first change the wheel size to see how that affects the robot speed. Then students can adjust the motor speed to see its affect. Each group's final robot design is the sum of all the adjustments its team members find necessary to create the fastest possible robot. As before, have groups test their robots five times, recording and graphing their results on the Linear Velocity Graph 2. Have students complete the data sheet questions. Distribute the post-activity worksheet and give students 10 minutes to complete it. As a class, review the post-activity worksheet. Specifically, focus on the relationships between linear velocity and angular velocity and how they relate to the data collected. Answer any class questions related to the material or prompted through the assessment. Pre-Activity Worksheet: Before the activity, have students complete the six-question Pre-Activity Worksheet. As a class, discuss student answers to assess their baseline knowledge of angular velocity and linear velocity as well as their understanding of its real-world applications. Activity Data Sheet: Have students use the Activity Data Sheet to guide them through the activity, record and graph data, and reply to questions. Review their answers and class discussion contributions to gauge their depth of comprehension. Post-Activity Worksheet : At activity end, administer the Post-Activity Worksheet to assess student understanding of the material and see if their scores increase from the pre-activity assessment. The pre- and post-activity questions are exactly the same, except one more question is added to the post-activity worksheet: Think outside of the box! Why do different vehicles—tractors, trucks, sports cars and SUVs—have different wheel sizes? What wheel size would you want on your vehicle and why? To construct the LEGO MINDSTORMS NXT or EV3 robot for this activity, follow the online tutorial, 5 -Minute Bot building instructions with many helpful images, at http://robots2doss.org/2013/10/5-minute-bot-for-the-ev3-kit/ . Arduino-controlled robot, as described in the excellent MakeZine tutorial at http://makezine.com/projects/build-your-own-arduino-controlled-robot/. Note that Maker Shed sells all the parts listed in the steps (although finding some parts on other sites such as Amazon may cost less). For example, the 4WD Arduino-compatible mobile platform they use is available for $59.99 at http://www.makershed.com/products/4wd-arduino-compatible-mobile-platform. Maker Shed sells the other necessary integrated circuits, and the Arduino Uno can be purchased from Arduino at http://arduino.cc/en/Main/ArduinoBoardUno.